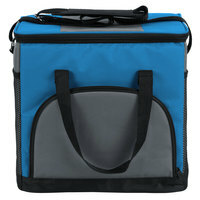 This Choice insulated blue cooler bag is perfect for your next outdoor gathering or tailgate party! 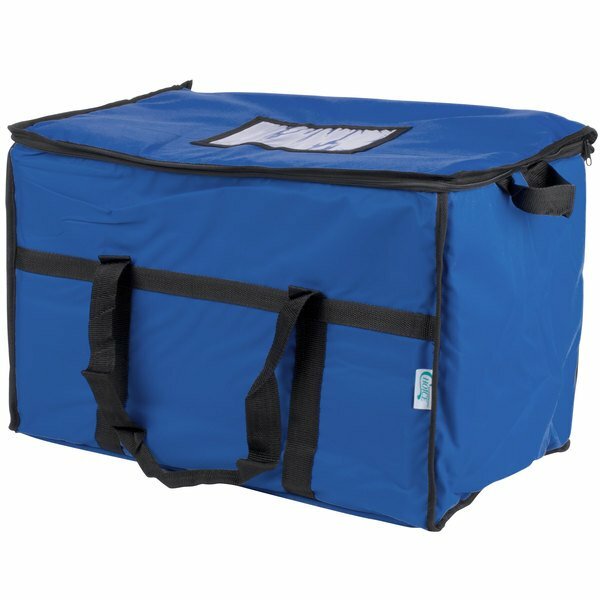 This cooler bag is designed to hold and keep food items chilled and ready to serve throughout transport or service! Its roomy interior compartment can be used to carry cold subs, sandwiches, drinks, and even hinged lid take out containers from your kitchen to your event's location. "Fantastic value for the price. Can fit a ton of food in cooler and is easy to transport. Couple ice packs in it and it keeps everything cold." 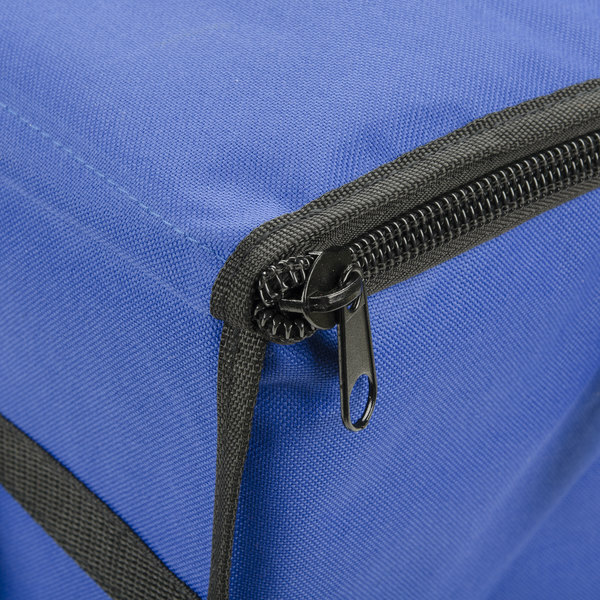 A rugged, blue nylon exterior ensures this cooler bag is built to last. 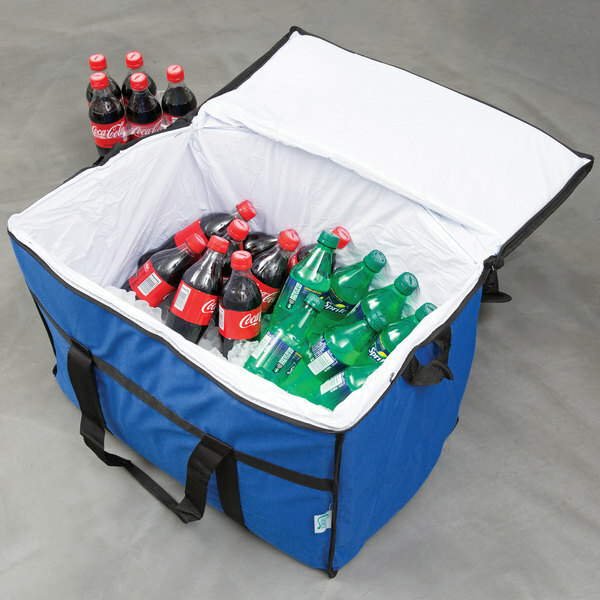 This cooler features two strong carry handles on each side to make transporting easy. Designed for superb performance and insulation, this bag includes a heavy duty zipper to make it easy to load and unload cans. 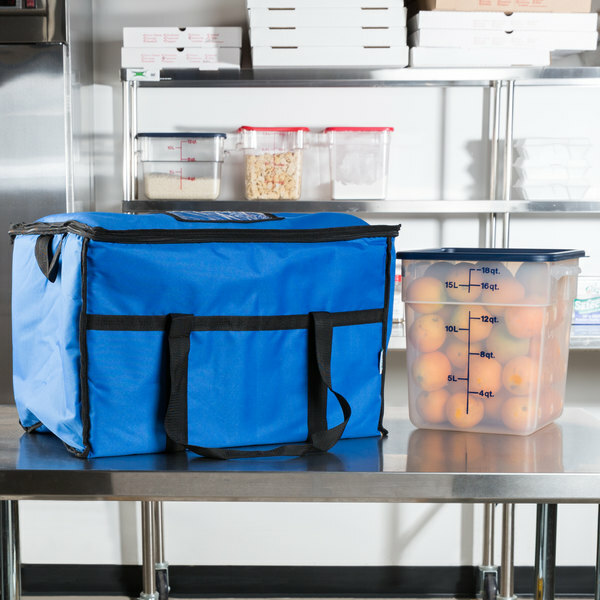 Thanks to its water resistant interior, this cooler bag can be used to transport hot and cold subs, sandwiches, and even your hinged lid take out containers. Plus, the material is easy to wipe down and clean at the end of each use. Properly identify the contents of your cooler bag with the label window. 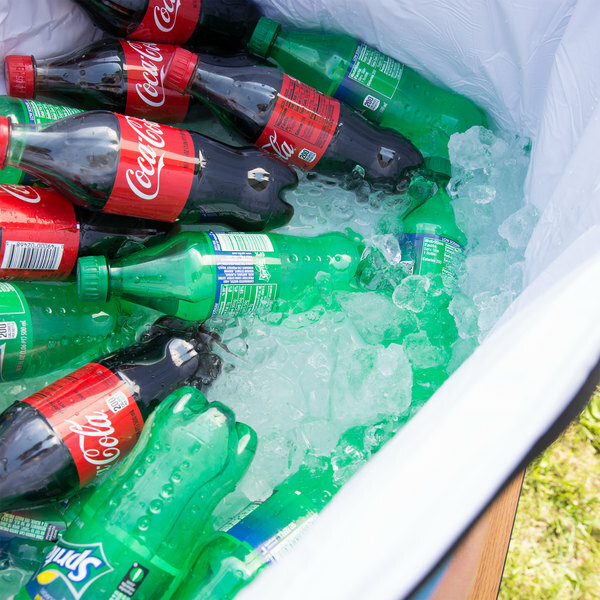 This will minimize staff needlessly opening the cooler to check the contents thus keeping your items cooler longer. 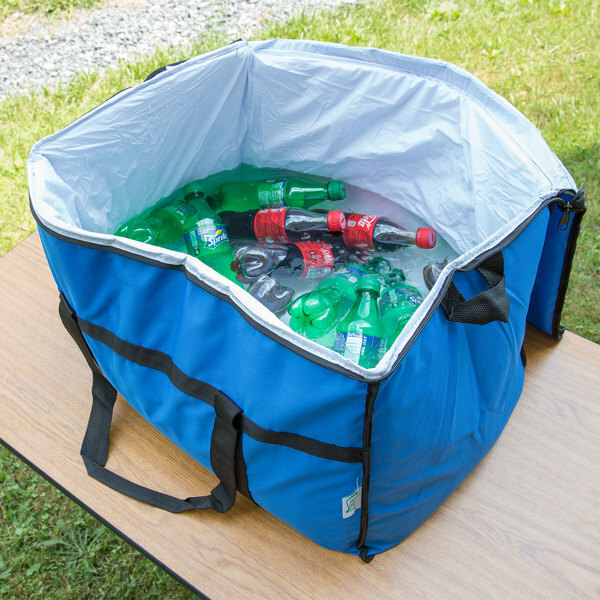 Maximize your storage area by folding this cooler bag down when not in use! 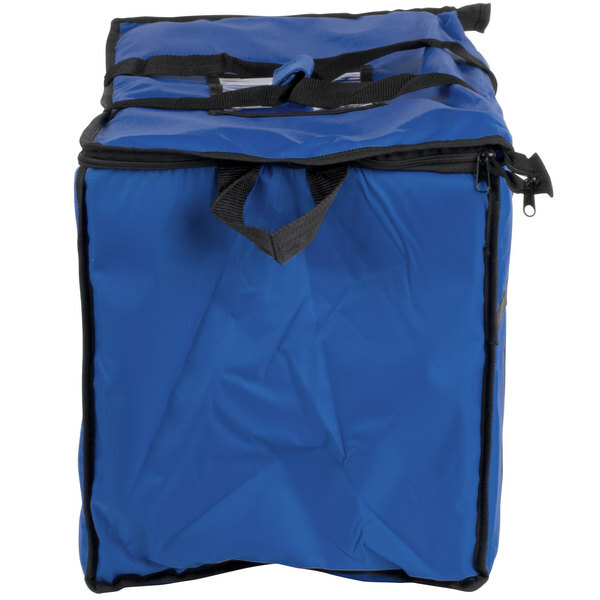 What types of items can I fit into this Choice insulated cooler bag? 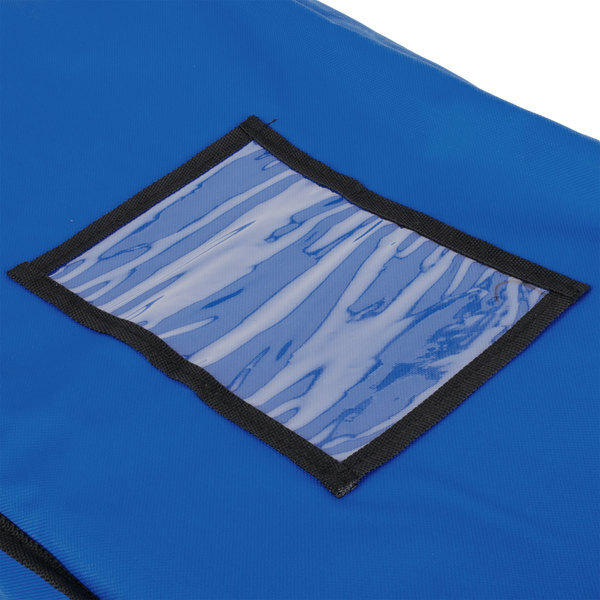 What Fits Inside a Choice Insulated Leak Proof Cooler Bag? 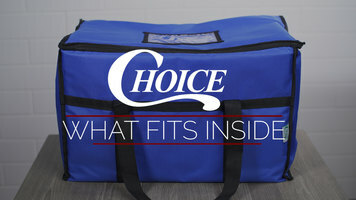 Find out what this Choice cooler bag can hold! Its versatile design will allow you to carry and deliver a variety of items. 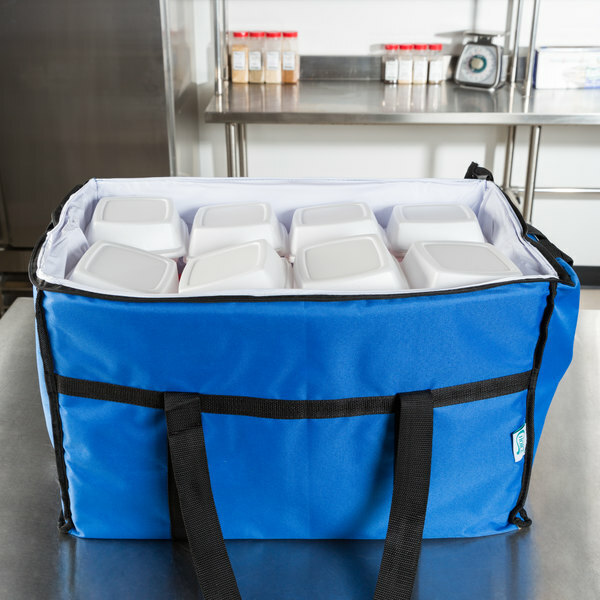 Expertly transport and deliver 24 small takeout containers, 72 beverage cans, or (5) 3" deep full size steam table pans with this Choice cooler bag! 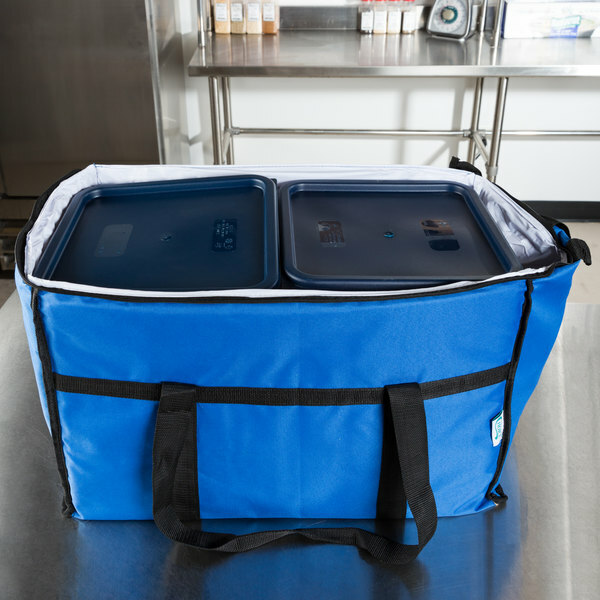 Item #: 124FCARKITBL Choice Insulated Food Delivery Bag / Soft Sided Pan Carrier with Foam Freeze Pack Kit, Blue Nylon, 23" x 13" x 15"
Thank you for the review, Rachel! We're sorry the handles broke on these bags. Our Customer Solutions team was happy to credit you for these. 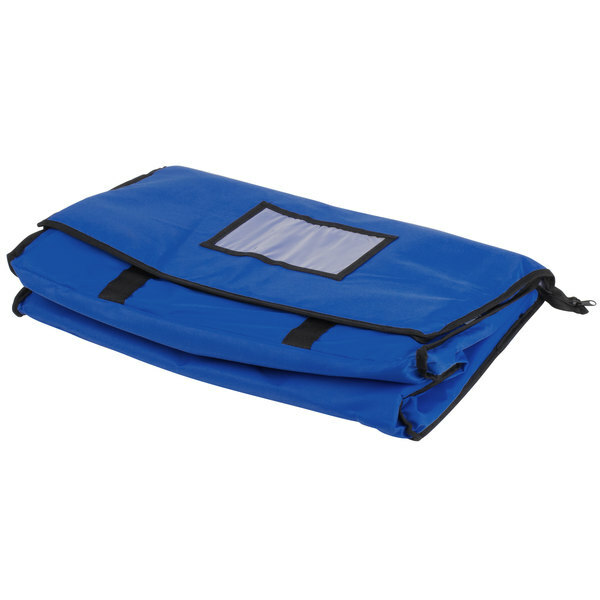 Great insulated bag for catering those smaller jobs. This bag works very well for keeping hot foods hot and cold foods cold. I use a blue one for cold and a red one for hot. These insulated leak proof bags are amazing I ordered these bags for my online cupcake catering business. The bag is big, the color is vibrant and it’s leak proof. I ordered the blue it’s very pretty and strong will hold up for a long time. These work really well and hold the food at a good temp for our short transport time. We've had some of the little side handles rip when they are loaded up but the main handles are sturdy. 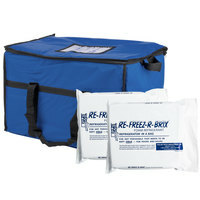 inexpensive option to other freezer bags, but has held up will with no rips or tears and zipper still functional. Thin insulation but sitll good for holding frozen products 3-4 hours. 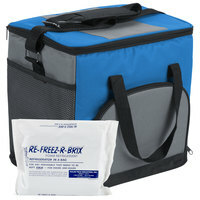 This insulated cooler bag keeps products perfectly cool, just add a couple of ice packs and delivery is on the way! . It is a reasonably pricing cooler bag. Easy to clean up. Great sturdy cooler. 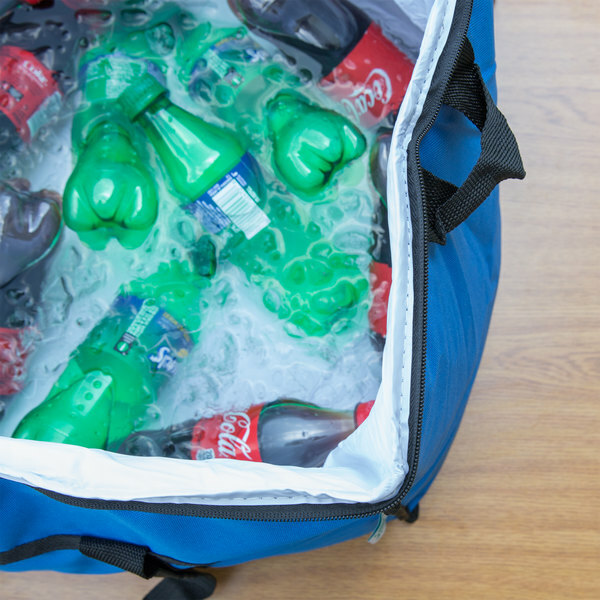 Easy to transport and kept beverages ice cold. Folds flat for easy storage and easy to clean after each use. Great product at a great price. THIS INSULATED COOLER BAG KEPT ALL MY CATERING VEGETABLES COOL FOR TRANSPORTING IN THE SUMMER. i WILL BUY AGAIN. iT WAS EASY TO CARRY AND LOAD. A very useful item! 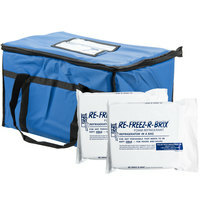 When used with freeze packs, it has kept my food cool/cold. The only thing that I did not like is that the smaller handles on the side ripped off the first time I used it. 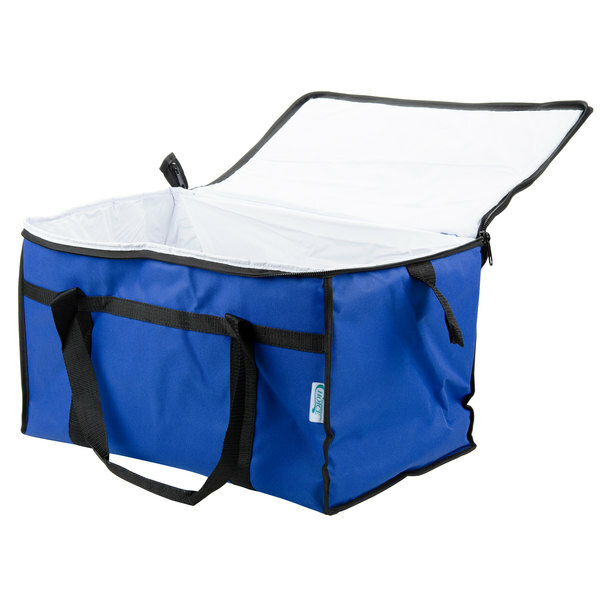 But I think for the price, it's a worthy addition and more convenient than an actual cooler- folds up for easy storage as well! I am eating crow writing this. I thought I was going to be disappointed with this bag (tote). In actuality it is by far the best tote I have used. And I have used many. It was the small zipper that I thought wouldn't hold up. Wrong. In fact I ordered more immediately just in case. On a shelf they sit. Decent storage bag. Best to use foil pans and not real metal, as the inside material on the sides rips easily. A hot box is definitely better for long-distance travel. Nice bag for transports or storage of goods it holds warm or cold. Fit our bicycle basket we use for the delivery of Togo containers. fit side by side 2 medium containers. Used mostly for shopping trips to keep things frozen/cold. Durable thus far, collapses down relatively small so it doesn't take up a lot of room when not being used. Would buy again. we ordered the insulated cooler. It works well to keep our pies cool.The bag had a small hole in it when shipped . The company was nice enough to send another bag quickly. Works well to keep things cold, or possibly hot. I like the clear tab to be able to put business cards or menu in. Fairly well made, side handles rip easily. Can't be beat for the price. 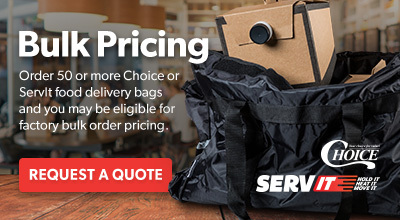 We use the bags to ship out food service orders to our C-Stores. 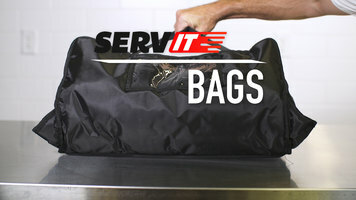 These bags hold a TON of product and have been pretty sturdy. We have experienced some ripping of the handles from the bag as well as around the zipper, but we are using these bags daily and filling them to the max. They have been easy to repair. We purchased a couple dozen and have no Major complaints. It is often challenging to find a nice, durable cooler large enough for casserole dishes or pans of meat. We had needed something to carry and keep cool a large amount. This Soft Sided Insulated Cooler Bag worked perfectly. Folds flat for storage as well. 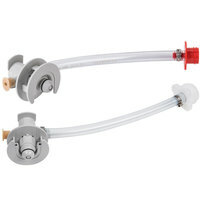 Works great with a couple of 62-oz Freeze / Cool Packs (item#4504943). Fantastic value for the price. Can fit a ton of food in cooler and is easy to transport. Couple ice packs in it and it keeps everything cold. I bought two and used them yesterday for a festival. In one I kept strawberry rolls and in the other I kept nut rolls and a few other things. These fit 2 large containers and room on the side! They kept my baked goods fresh and cold all day with the ice packs I purchased.